← The trolling motor of the future is here. I love to see a B n ‘M pole bend like this! This photo says so much. Brush piles and timber will hold crappie all winter. Just find the right depth and the fish will eat. 45-year tackle industry veteran Marketing and Crazy Ideas at TTI-Blakemore Fishing Group (Home of Road Runner Lures and six hook brands including Tru-Turn, Daiichi, XPoint, Team Catfish, Mr. Crappie and StandOUT Hooks.) Home of Gun Protect. The opinions expressed in this blog are those of TJ Stallings and not necessarily those of TTI-Blakemore. 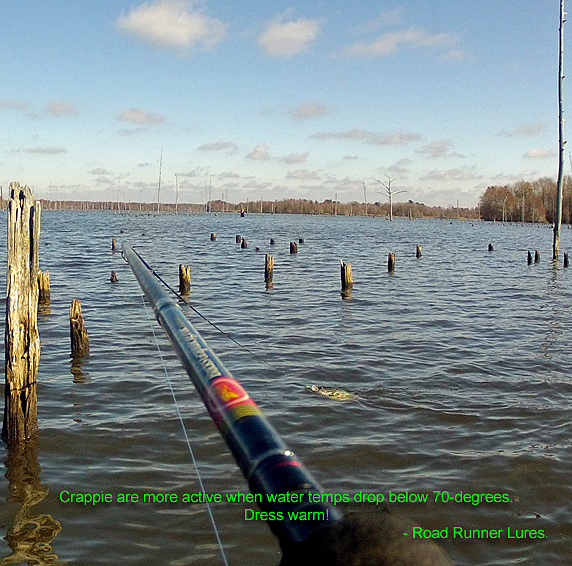 This entry was posted in Fishing and tagged B n 'M Poles, crappie fishing, Santee Cooper. Bookmark the permalink. Merry Christmas to you as well Tj … thx for the ‘like’ buddy. Nothing like some cold water paper mouths. Keep blogging away we truly enjoy it!